Serendipity is Sweet: Happy Birthday Bella! A year ago on December 2nd, a sweet little puppy was born. She came into our lives last February and she has grown a whole lot since then! Now she's a big girl, and she's one of us; part of the family. We can't imagine life without her. 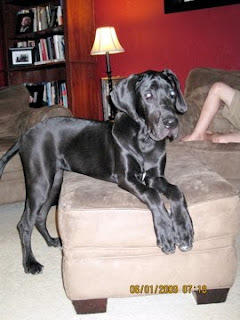 She's our sweet, goofy, playful, great dane girl. Happy First Birthday Bella! Aww!! Happy Birthday to Bella! That's how I feel about our pup that we got in March!! Aw, that's a big puppy! Oh my goodness she's grown so much! OH My GOODNESS! The picture of her as a puppy is adorable!!! Happy Birthday Bella! I love the one with her face in the box of treats. LOL Loved the pictures. Beautiful dog! Awww...what a cutie! Happy birthday big girl! 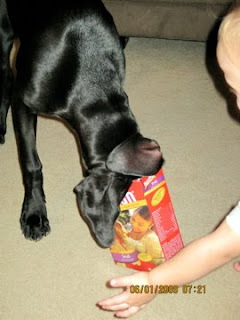 We had a Dane years ago, wonderful dogs!